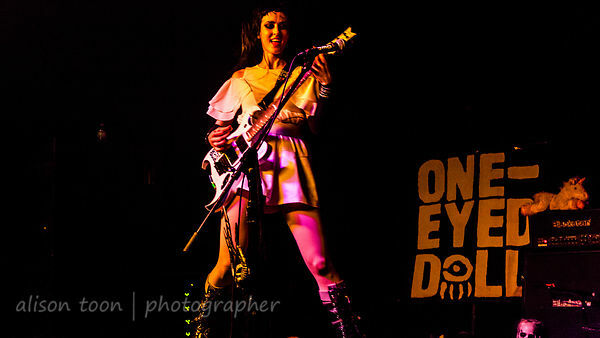 Toon's Tunes : One-Eyed Doll, last night of the Visions tour... all eyes on One-Eyed Doll! 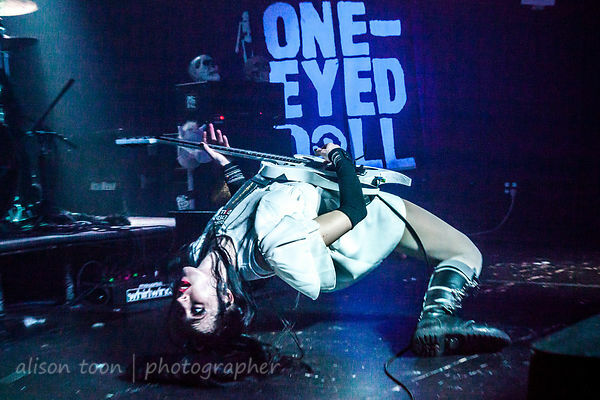 One-Eyed Doll, last night of the Visions tour... all eyes on One-Eyed Doll! We are very lucky, here in Sacramento. 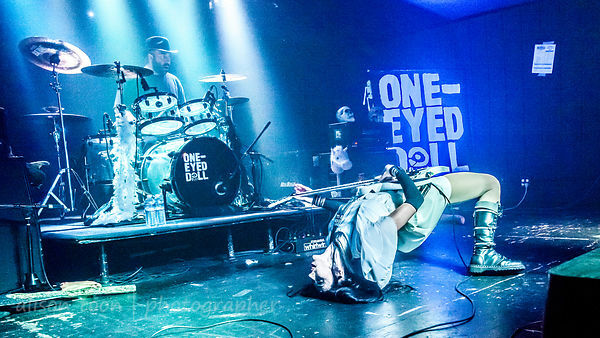 One-Eyed Doll has come to town every year for at least four years, performing at the Ace of Spades, and at the Boardwalk in Orangevale. Last year, on the Witches tour; last week, for the last date of the Visions tour on Saturday, 30th April 2016 (both the co-headliners Eyes Set To Kill, and support Open Your Eyes, had eyes in their names too). Total entertainers, this two-person-band keeps the all-ages audience engaged, enthralled: Jason "Junior" Sewell on drums, Kimberly Freeman on guitar and vocals. Kimberly, the ultimate storyteller, a contortionist guitar-player, beautiful vocalist. The stage is littered with skulls and a furry unicorn. Kimberly wears a crown, a jester's hat, and the personalities of the characters in the songs. 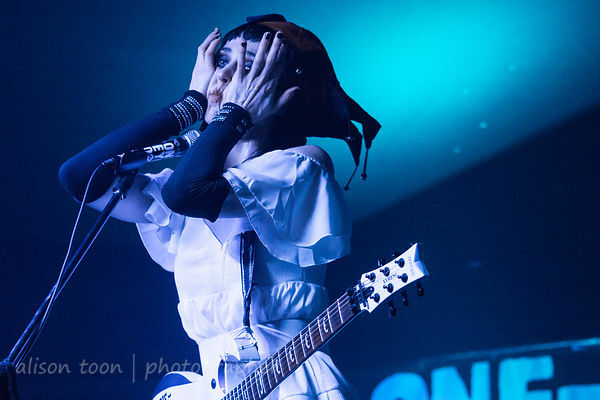 With music ranging from fun songs about straying boyfriends, propane tanks and serial killers to serious American history (the Salem Witchcraft Hysteria of 1692) a One-Eyed Doll show is an adventure and a musical experience. Don't miss them next time they are on the road... I bet it won't be long! For more information about One-Eyed Doll, check out their Facebook and website. 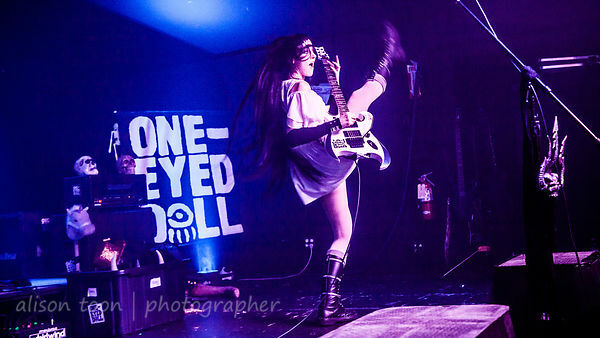 More photos in the One-Eyed Doll Visions tour photogallery!